You there, against the — the Dixie cup and get out on the dance floor. Under the flickering lights, behold! - took this photo a few weeks ago on Sunset Boulevard in West Hollywood and find myself thinking about this poor guy way too often. Beyond wondering about what goes through his mind all day long (Isn’t this how Brad Pitt started? 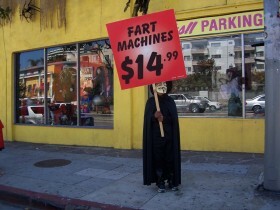 ), my question is this: isn’t $14.99 a little steep for a fart machine? - just relaunched my author site to include a deeper archive of clips and a Flickr site of photos, doodles and found art. Fun stuff. -he unstoppable force for good known as Kim and Jason Kotecki have done a sweet redesign of their website devoted to Adultitis, the Jason-named condition marked by over-seriousness, chronic dullness and all the other assorted qualities rejuveniles seek to avoid. Take the online intake questionaire and begin your treatment today! -ond goes rejuvenile: In a clever co-opting of moves that mix Kung Fu grace with Spiderman daring-do, the new Bond movie Casino Royale gets an thrilling kick from the age-norm-busting urban gymnastic known as parkour. Producers cast Sebastien Foucan, the parkour pioneer featured in chapter 3 of Rejuvenile, as Mollaka the Bomb-Maker, who leads Bond on an intense opening foot chase. Not shabby for a 36-year-old dad.